It’s been about seven years since I’ve first heard Bishop Allen. It was a shot of smart jangly indie rock before their was a Vampire Weekend. It was Ivy League, but less verbose and Graceland-esque then that band that would soon follow. But while those boys from Columbia have grown and refined with each passing album, the Harvard folks from Bishop Allen have seen diminishing returns. Before expounding, I should say they put on a great, tight show. All the songs that I loved from that time burst through in fantastic fashion. 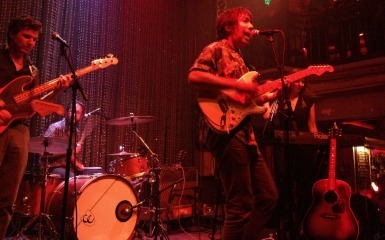 Even the ones from beyond sounded better and warmer in the small confines of Johnny Brenda’s in Philadelphia. 2007’s “The Broken String” is a near perfect album, but 2009’s “Grrr…” and the recently released “Lights Out” have been unable to duplicate such feelings. I mean, it makes sense in a lot of ways. I won’t pretend to know the inner-workings of the band, but in the time since 2007, OKCupid (of which bassist Christian Rudder is a co-founder) has become kind of a big deal. So maybe those algorithms that once produced hooks now only produce hookups. Rudder’s waning involvement in the album process is evident on stage. He seemed almost separate from the rest of the band at their show at Brenda’s. Like a suit picked to sit in with the cool kids. But, as I said, they are still a lot of fun in that live setting. It’s a nice reminder of how great “The Broken String” and “Charm School” were as albums. Unfortunately, it also serves as wish, that it could be captured more in the albums that have followed.